It’s been a while since my last phone charger review so I thought I’d review the cheapest Quick Charge 2.0 charger I could find. It turns out to be the CD122 from Ugreen for only 5$! Let me start off by saying that I don’t really see the sense of a 1 port charger. Yes it’s smaller in size but not THAT much smaller that it makes sense to me. It is cheap though so maybe that aspect appeals to people. I did want a charger that supports Quick Charge because from what I have seen so far while testing, the Quick Charge chargers are doing very well. I’m starting to get the impression that Qualcomm puts your charger design through the ringer if you want to include Quick Charge and that because of that no real bad QC chargers exist! But I might do a separate review about that sometime. As normal I did a video review with my opinion about the charger. Check it out to see what I thought of it! As I already said in the video, the charger did very well. I did see some different patterns during testing then I’ve seen with other chargers (more about that below), but still does very well! At the normal USB voltage of 5v it did very well. Topping out around 3.60A with a very respectable voltage drop. Excellent! With the 3.60A it can deliver it should also be well suited for phones that don’t use Quick Charge but forms of high Amperage 5v charging often called “Turbo Charging”. Using Quick Charge 2.0 it start off very good but we see a bit of a different pattern then with previous chargers. Around 2.90Amps suddenly the voltage drops to around 6.5v and when drawing more Amps it drops to 5v (thus ~4.5v because of voltage drop). I haven’t seen this bevahiour before but I think it’s an internal safety mechanism if the device that is charging starts drawing too much power. At 2.90A and ~9v it’s providing around 26 watt which is well above the 18w that is specified in the QC2.0 specifications. So no problems here! With 12v QC 2.0 we see the same pattern. It starts off at 12v, voltage drop is okay but at around 2.10A voltage starts to take a hit. First a little bit but around 2.30A it goes all the way down to around 8.0v! It can’t hold that for long and drops down to 5v and continues charging at that voltage. Still, looking at the values, it only started to drop off well above the needed 18w of power delivery so in practice this shouldn’t give you any problems! For just 5$ (it was on sale) this charger is good value! If you just need a charger that will charge all your devices quickly, I think it will be a good buy for anyone. 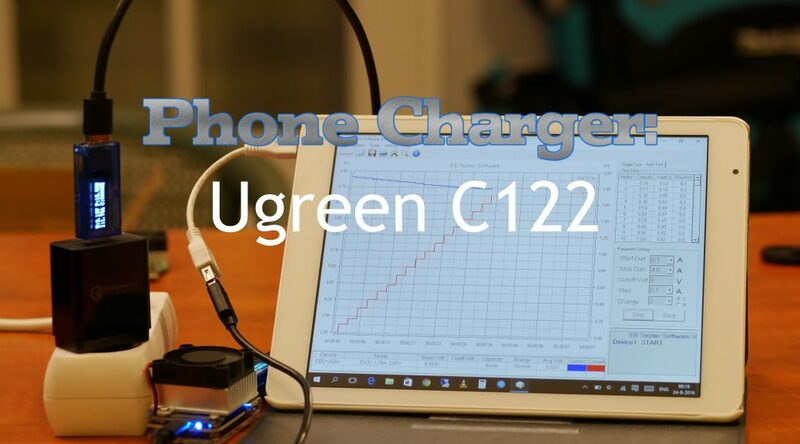 As mentioned above, you can check out the charger over here: Ugreen 1 port Quick Charge 2.0 charger and while you’re at it, maybe also order a 3m/9FT micro-USB cable to go with it?